‘The Met Office relocated to Exeter in 2004’, this was a bizarre fact I came across when checking the weather before my departure, just after booking my accommdation from a map of hostels in Devon. Quite honestly, after several weeks of high-winds, driving rain, storms and flooding, I was expecting to be hearing more from the weather forecasters, rather than the hubbub of the historic yet vibrant Devonshire city, to which I was headed. With much relief, when stepping from the train at Exeter Central, there seemed to be calm and even the reassuring sound of seagulls squawking overhead. 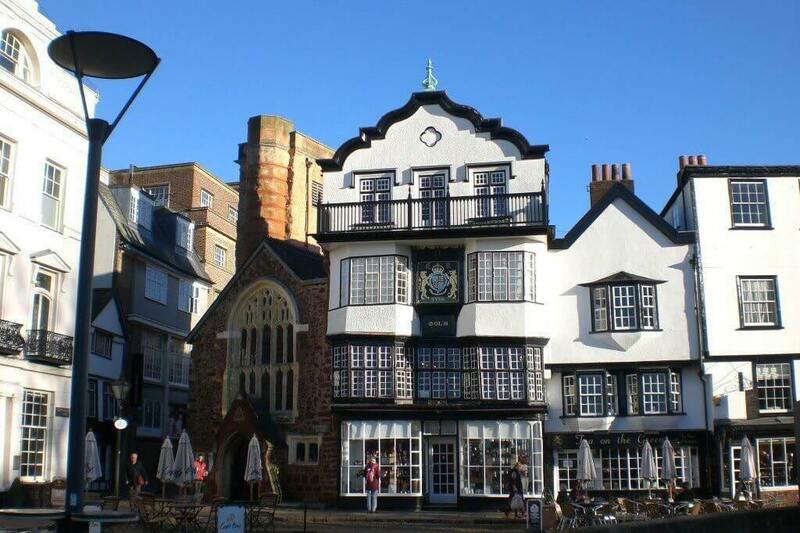 Exeter is a place that immediately wooed me with its’ quaint cobbled pathways, wonky medieval architecture and of course ornate cathedral that remains head and shoulders above the city landscape. 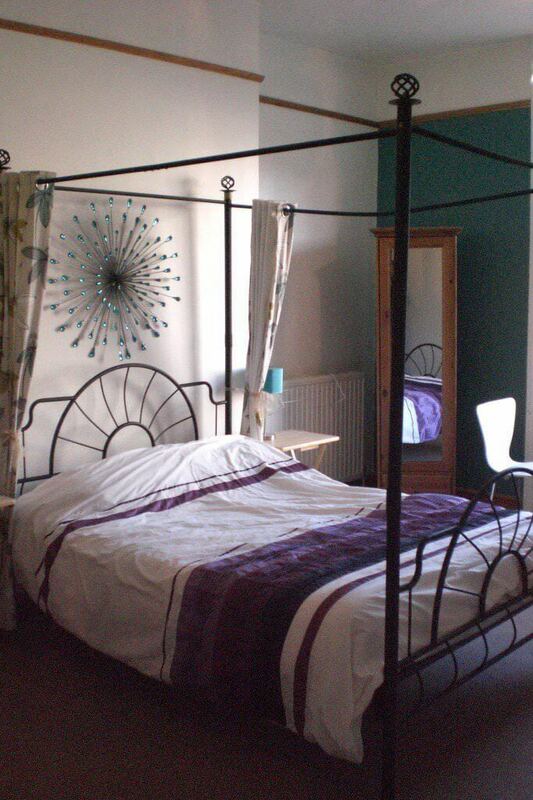 What I did not expect was that my bed for the night, in the EXETER GLOBE BACKPACKERS hostel, was housed in an 18th century townhouse in the very heart of Exeter. A magnificent façade greets travellers on their arrival and is worth admiring before stepping inside. 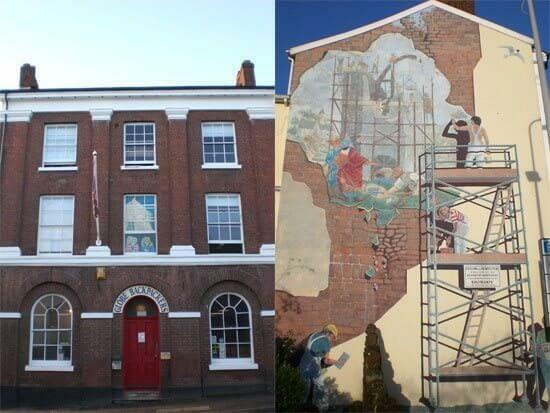 Period features remain on the exterior and are mixed with fun murals depicting guests peering from a window, whilst the entire gable end of the building has become a canvas full of quirky art. I was eager to introduce my luggage to my beautifully appointed private room before setting out to explore, (rarely do you use the words ‘beautifully appointed’ in reference to a hostel but in this case the four poster bed swung it for me). 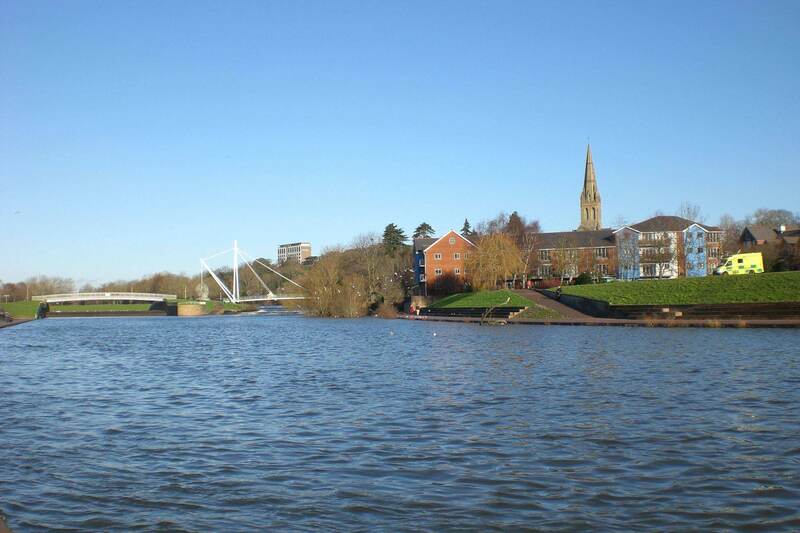 The south west region of England is blessed with many an idyllic village, town and city. Exeter must rate highly amongst them. Intertwining history, culture, shopping and a first rate university are just some of the city’s most notable characteristics. 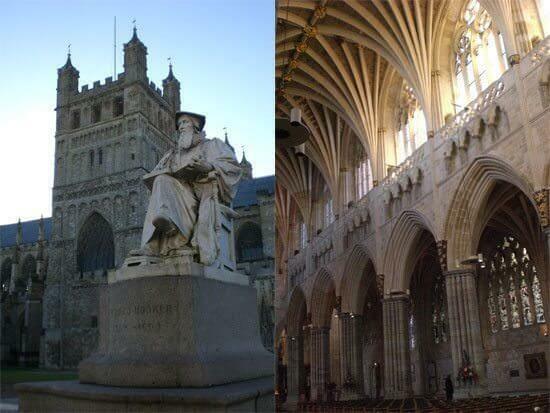 The founding of Exeter Cathedral dates from 1050 and has been a place of a refuge, worship and congregation ever since. Intricate carvings, the astronomical clock and the majestic vaulted ceiling within, that leads the eye all the way down the main body of the building are just a few of the spectacular features to admire. Back in 1268 when the city and Cathedral were constantly at odds, a wall and several gatehouses were erected to keep the two separated, now a few narrow and cobbled alleyways branch out into the modern city beyond. This remarkable landmark, together with the medieval houses enclosing the Cathedral grounds, provide such a quintessentially English scene that a camera lens can rarely do it justice. The shopping precinct of ‘Princesshay’ (the first pedestrianised shopping street in the country), lies within the area that would have been the Roman City walls; remnants of which are beautifully preserved at every twist and turn. A plaque can be seen on one stretch reading “Built by the Romans about 200 A.D., since repaired by others. Much of the city wall still stands, some of it original Roman workmanship”. 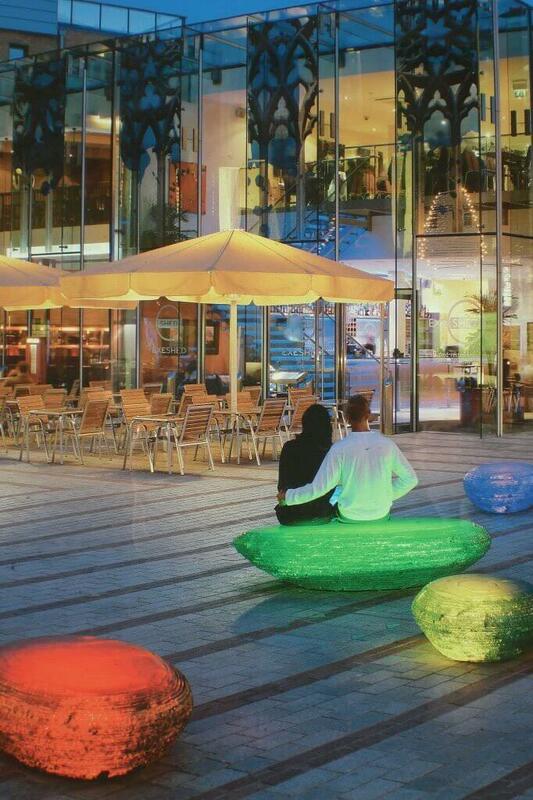 The many Layers of the city’s history has been cleverly incorporated into several parts of ‘Princesshay’ alongside significant artworks, such as, Jeff Bell’s collection of glass ‘pebble seats’. Inspired by the texture of Exeter’s weather beaten surroundings, they have been carefully placed to ‘reveal’ a sightline from ‘St. Catherine’s Chapel & Almshouses’, through the public meeting place and directing the eye towards the spectacular vista of the Cathedral. Such clever installations, provides plenty of inspiration to a large student population. The city’s student fraternity contribute much to Exeter’s’ multicultural and energetic feel. Whilst walking through ‘Princesshay Square’, I happened upon the University’s Footlights Company performing and promoting their upcoming production of Westside Story complete with 1950’s style letterman jackets and quiffs. 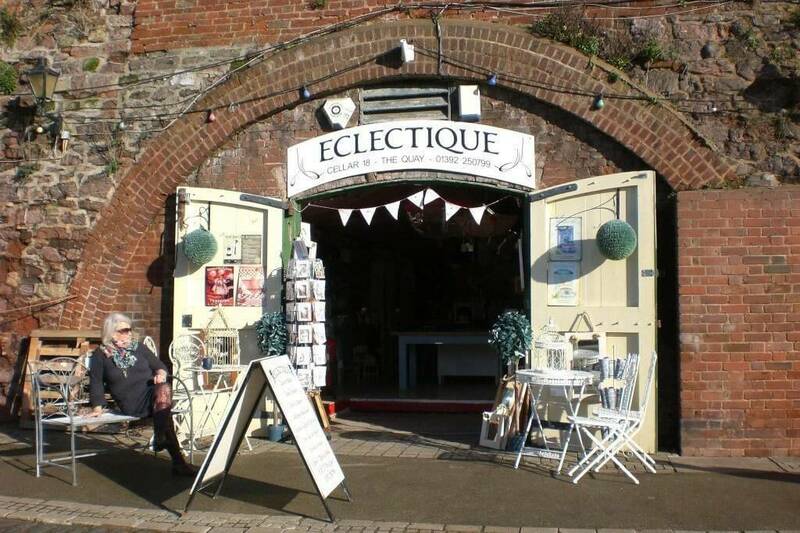 Such creativity is also the likely reason why there is a diverse mix of retro, curio and craft shops that pepper the walk down towards the Quayside and the River Exe. The Quayside offers its own collection of shops, restaurants and outdoor activities, which blend with 17th and 18th century warehouse buildings that in yesteryear would have been a hive of trading activity, shuffling goods to and from the river. Today, the hustle and bustle comes from weekenders trying to secure one of the prime seats outside the Quayside coffee shops to watch the ebb and flow of Exeter life. Before I found my space amongst locals and tourists for a cappuccino, I took a brisk walk along both sides of the River which was precariously high and threatening to spill onto the tow paths. However, the river and the rain held off long enough for Exeter to show me her eclectic charms under a blue sky and not once did I have to trouble the met office for an update!